Danny Cannon’s adaptation of the 2000 AD comic strip Judge Dredd was roundly dismissed as a disaster, coming unstuck not only because of its star’s ego (he made the fatal mistake of taking the helmet off); but also because of Rob Schneider in the role of comedy sidekick. Perhaps it was the toxicity of his presence that lead to the desolate futuristic landscape. The main thing remake Dredd 3D gets right is the casting of the central role. Out goes Stallone and in comes Karl Urban, already a dab hand at re-interpreting famed characters because of his role as Bones in JJ Abrams’ Star Trek reboot. Urban leaves ego at the door: he always keeps the helmet on, throwing emphasis on his body language, voice and unshaven chin. It’s a pretty thankless task for an actor (which is presumably what Stallone struggled with) but Urban nevertheless engages as a wry-humored, monolithic presence. Director Pete Travis and screenwriter Alex Garland also waste no time in establishing the violent, futuristic society which Dredd is patrolling. The film starts and, 30 seconds of expository voice-over later (the place is Mega-City One; he’s a Judge from the Hall of Justice), we’re plunged straight into a white-knuckle van chase in which an innocent pedestrian is reduced to the state of tomato puree. The action is simple, brutal and crisply shot, something which stands the film in good stead as it proceeds. Forced to break in psychic rookie, Anderson (Olivia Thirlby) on her first patrol, Dredd finds himself sealed inside a gigantic, crime-ridden apartment block whilst trying to apprehend a murder suspect. The building, Peach Trees, is ruled over by psychotic drug lord Ma-Ma (Lena Headey) and it’s from here that the Mega-City One’s latest epidemic is spreading: a new drug called Slo-Mo, which causes time to slow to 1% its normal speed. Trapped inside, both Dredd and Anderson are forced to fight for their lives. Many will automatically make the comparison with the terrific martial arts movie The Raid, which similarly dealt with cops stuck inside a crime-infested building. However, this is more an unhappy coincidence as Dredd 3D went into production before The Raid and anyway the stakes are higher in this instance: the two judges are the only two good guys on the scene. The futuristic trappings also distinguish it from Gareth Evans’ Indonesian actioner. Taking its cue from Urban’s gravel-voiced hero, who sounds like a truck that’s struggling to engage first gear, the film ploughs onwards with ruthless efficiency. Much like the eponymous judge who also appoints himself jury and executioner, the film takes no prisoners when it comes to the ferocious blasts of 18-rated action (a refreshing change to the cleaned-up comic book films we’ve become used to). Stylishly shot by Travis, some of the set-pieces are striking: a spaced-out shoot-out from the perspective of those under the influence of Slo-Mo filters the splatter through a dreamy haze. Travis’ use of the Slo-Mo drug effectively clashes with the grimy design of Mega-City One: instantly we understand why the crims find it so alluring. Another effective gimmick is Anderson’s psychic ability: Travis and Garland are sensible enough to deploy it for both comic and dramatic effect without ever overplaying their hand. It’s disappointing however that the film has to give into the 3D gimmick: if it compels at all, it’s because the storytelling is so ruthlessly efficient and the action, pleasingly nihilistic. Although the film was shot using 3D cameras (a more admirable set of principles when it could easily have been retro-fitted), the composition of each image derives its strength from Travis’ instinctive visual flair, not the illusion of added depth. Likewise, Urban’s natural charisma doesn’t stem from stereoscopy: he brought that to the set, irrespective of the cameras used. The presence of Garland as screenwriter would have you believe that Dredd 3D is a satirical comment on what it means to give yourself utterly to the law, and whether this is misguided. 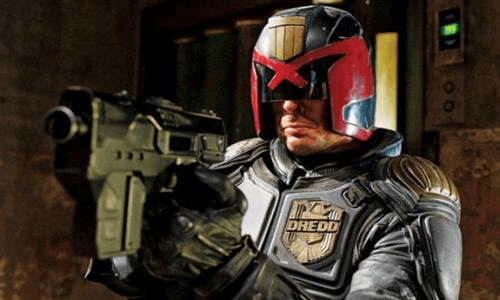 But despite Garland’s sci-fi background (he collaborated with Danny Boyle on 28 Days Later and Sunshine), Dredd 3D simply wants to sucker-punch you where it hurts. However, this isn’t a bad thing, because leads Urban, Thirlby and Headey all give enjoyable performances, and there’s a pleasing sense of physicality in the action sequences, not to mention tension in the quieter ones. It’s a film which reads you the Riot Act and then obliterates it in a hailstorm of gun-fire – as deep as an evaporated puddle but entertaining, nonetheless.